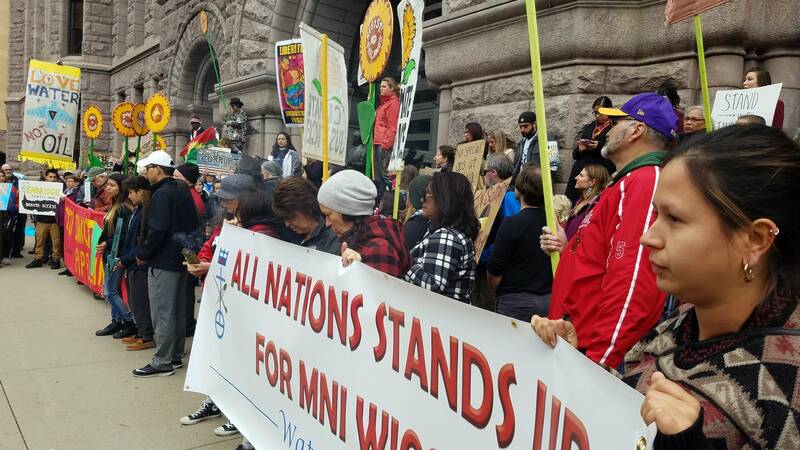 Hundreds of people gathered in downtown Minneapolis Tuesday afternoon, calling for Minnesota authorities to withdraw law enforcement help for police forces at the Dakota Access Pipeline protest. The gathering came after protesters spotted equipment with Hennepin County Sheriff's Office markings headed for a protest by pipeline opponents in North Dakota. "If the sheriff has the money to send people to North Dakota, we can take that money back and reinvest it in our communities," said Minneapolis city council member Alondra Cano. "We need to be doing the work here at home, not intervening in other projects in other states." A statement from the Hennepin County Sheriff's Office on Monday confirmed that the agency was sending equipment and personnel to Morton County, North Dakota, in response to a request by that state, and approved by the state of Minnesota. The request came under the Emergency Management Assistance Compact, a national mutual aid agreement among law enforcement and public safety agencies. Hennepin County officials wouldn't say how many deputies were sent in response to the request. The Anoka County Sheriff's office said that agency sent six deputies in regular squad cars to North Dakota. Washington County sheriff William Hutton said his department sent five deputies. "Reimbursement for expenses related to providing this service will be made by the State of North Dakota," said a statement from the Hennepin County Sheriff's Office. "The EMAC system was ratified by Congress and has been adopted as law in all 50 states — to ensure no sheriff, no deputy, and no state stands alone in the state of an emergency." 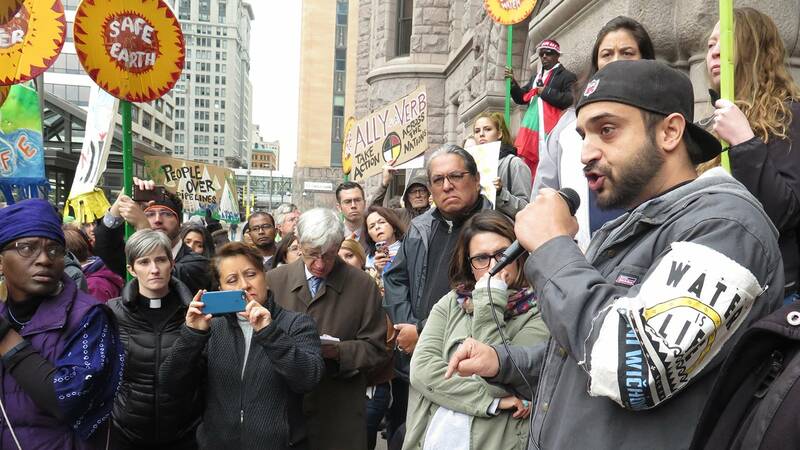 But opponents wanted Minnesota officials to rebuff the request nonetheless, saying they should defer to pipeline protesters. "This protest is supposed to be a peaceful, prayerful one, so I wonder why this county is sending their sheriff's deputies there," said the Rev. Robert Two Bulls, representing a group of clergy who helped organize the Minneapolis gathering. Others said that the petroleum pipeline threatened drinking water along its route and disturbed land sacred to Native Americans in the area, like the Standing Rock Sioux. The pipeline runs near their reservation. State Rep. Peggy Flanagan, DFL-St. Louis Park, and a member of the White Earth band of Ojibwe, urged county officials to stay away from the pipeline protest: "This request came in. And it's simple. No." The demonstrators later marched to the ground-floor lobby of the Hennepin County Sheriff's Office in the Minneapolis City Hall building. 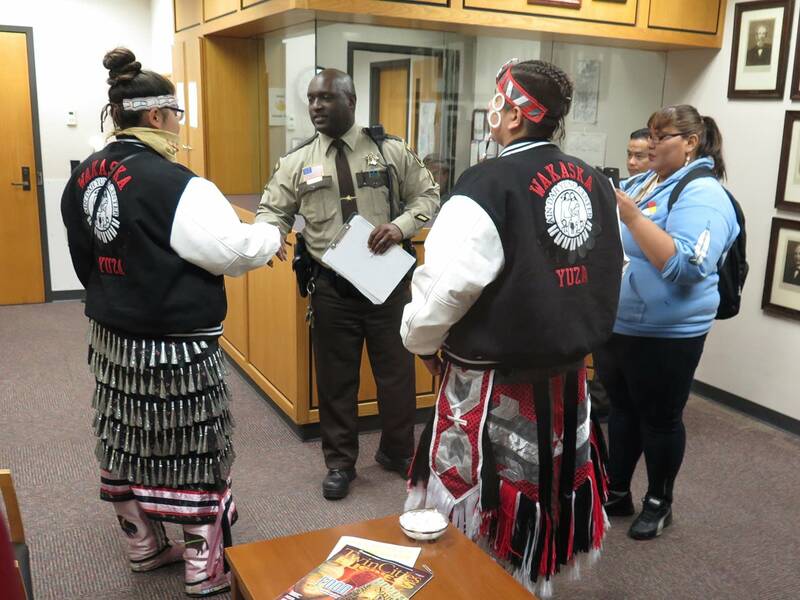 The Sheriff's Office initially locked its office doors as the protesters approached, but a waiting deputy later allowed a trio of demonstrators to enter and present a petition meant for Sheriff Rich Stanek. Correction (Oct. 26, 2016): An earlier version of a photo caption incorrectly identified Yash Shafiei.